LAS VEGAS (July 8, 2014) – In another remarkable testament to the health and strength of the game of poker globally, the 45th annual World Series of Poker (WSOP) at the Rio All-Suite Hotel & Casino in Las Vegas established a host of new records as poker enthusiasts from 107 different nations traveled to Las Vegas to compete in the game’s grandest spectacle. The WSOP remained the industry standard-bearer, with a record-setting 82,360 entries in 65 events and awarding the largest prize pool in WSOP history: $225,584,873. The new all-time high in participants surpassed by 3.6 percent the previous record of 79,471 set last year. The Main Event in 2014 had 6,683 entries, creating the largest prize pool of the 2014 WSOP at $62,820,200. The winner will receive $10,000,000. For the tenth consecutive year, the WSOP generated a total prize pool well in excess of $100 million, and for only the second time in its history, topped the $200 million mark. In the 45-year history of the WSOP, the prestigious tournament has now awarded more than $2 billion in prize money. When added to the previous total — $1,840,172,006 – this year’s massive prize pool brings the new all-time money awarded tally to $2,065,756,879. More than $1 billion of this has come in the last 6 years alone ($1,005,789,961). This year’s total prize pool surpassed last year’s amount by 14.4 percent. Additionally, the WSOP, renowned for its ability to help raise significant amounts for charity, has surpassed the $5 million plateau for the second time in three years. Through the first 64 events, WSOP players and tournaments have contributed $5,260,700 to the ONE DROP organization (www.onedrop.org). ONE DROP uses donations to directly implement water access projects, where an average of $100 can transform someone’s life forever. With the Big One for ONE DROP (Event #57), the Little One for ONE DROP (Event #62) and the All In for ONE DROP campaign, where players can donate 1% of their winnings to the cause, the poker community via the World Series of Poker has donated more than $12,000,000 since the partnership began in 2012 – enough to directly impact the lives of over 100,000 people. Legions of amateur players competed alongside legendary poker pros, Hollywood A-listers and international sports figures to establish the new milestones. Among the notable non-poker playing names competing during this year’s WSOP included: UFC Announcer Bruce Buffer, Movie director Nick Cassavetes (Notebook), actor Justin Henry (Kramer vs. Kramer), Model Triana Iglesias, NBA star Paul Pierce, Spain World Cup/FC Barcelona soccer player and singer Shakira’s boyfriend Gerard Pique, actor and comedian Kevin Pollak,, Curb Your Enthusiasm producer Gavin Polone, professional soccer player John Arne Riise, actor and comedian Ray Romano, NFL defensive star and Super Bowl champion Richard Seymour, actress Jennifer Tilly, cricket superstar Shane Warne, NASCAR driver Jason White, actor James Woods. The youngest player in this year’s WSOP Main Event was Zachary Zaffos, of Weston, Florida, who played Day 1-C of the Main Event and turned 21 just one day before entering. The oldest player to participate in this year’s Main Event was 93-year-old William Wachter of Carmel, New York, who played Day 1-B. Wachter, was also the oldest participant last year. Both players were eliminated on Day One. Jack Ury, at the young age of 95, still holds the WSOP record as oldest participant. Poker Hall of Famer Henry Orenstein became the oldest person to cash this year, when the 90-year old finished in eighth place in Event #60. The $10,000 No-Limit Hold’em World Championship – commonly referred to as the WSOP Main Event, attracted the largest number of players since 2010, becoming the fifth-largest WSOP Main Event in the 45-year history of the event. Largest non-Hold’em event field size ever: Event #3, the $1,000 Pot-Limit Omaha tournament, attracted 1,128 entries, making it the largest field ever sat to play poker outside of a Hold’em event in live poker history. Largest Omaha Hi-Lo 8-or Better event ever: Event #14, the $1500 Omaha Hi-Lo 8-or-Better attracted 1,036 players, making it the largest Omaha 8 or Better tournament ever held. Largest 2-7 Draw Triple Draw Event: 348 players entered Event #16, the $1500 2-7 Limit Triple Draw tournament, the largest ever field for 2-7 Draw Triple Draw. Largest Seniors event in history: Event #17 attracted 4,425 players, eclipsing the previous record of 4,407 set last year. The prize pool was a record $3,982,500. This event is the largest single starting flight $1000 event ever. Biggest Prize-Pool For Razz Event: Event #18, the $10,000 Seven Card Razz event created a prize pool of $1,052,800, the first time a Razz event has ever eclipsed $1,000,000 in total prize pool. Largest Pot-Limit Omaha 8-or Better ever: Event #48 featured 991 players, the most ever for the Pot-Limit Omaha 8-or Better variant of poker. Monster Stack Lives Up to its Name: Event#51 featured 7,862 players, the most players to ever play in a non-re-entry $1500 event. Thus it goes in the record books as the largest single-day, non-re-entry tournament ever. It is the third largest poker tournament ever held and is the second-largest by number of unique players (7,862). It also awarded the largest prize ever for an entrant in a $1500 buy-in event, when the winner, Hugo Pingray of France took home $1,327,083 for his first ever WSOP cash. All final table participants took home six figure paydays, with Pingray taking home 884 times his initial investment. Largest $10,000 buy-in tournament in discipline other than No-Limit Hold’em: Event #64, the $10,000 buy-in Pot-Limit Omaha championship attracted a record 418 entrants, the most players to ever enter a poker tournament with a buy-in of $10,000 for a game other than No-Limit Hold’em. It was the largest PLO tournament the WSOP has ever held at the $10,000 buy-in level, and the largest field size for a WSOP $10,000 buy-in event outside of the Main Event. Prize pool was a record $3,929,200. Most events with $1MM+ First Prize: (Tie). Five distinct events (Event #8, Event #46, Event #51, Event #57 & Event #65) paid the winner more than $1,000,000 in prize money, tying a WSOP record set last year. Two events (Event #57 and Event #65) made multiple millionaires from the prize pool. Most events with $10MM Prize Pools: Four. 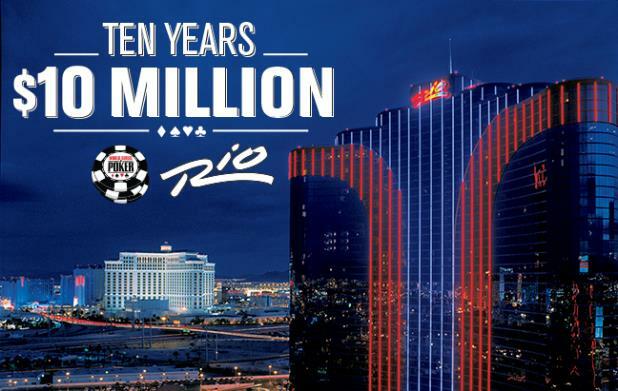 Keeping with the “10” theme of celebrating 10 years at the Rio, four events (Event #8, Event #51, Event #57 & Event #65) eclipsed $10,000,000 in total prize pool per event. Largest Main Event Starting Flight: Day 1C of the Main Event drew a record 3,768 entrants, the most-ever to start on one day in Main Event history. Most consecutive annual WSOPs played: Howard “Tahoe” Andrew of Walnut Creek, Calif., extended his record this year for most consecutive years played at the WSOP: 41. Most cashes at WSOP without a win: Tony Cousineau of Daytona Beach, Fla., extended his record as the player with the most cashes – 67 – without a win. He cashed nine times in 2014 (not including Main Event). All-time Cashes and Final Tables: 13-time WSOP bracelet winner Phil Hellmuth added to his record as the individual all-time leader in cashes (107) with his seven cashes in 2014. With his two final table appearances this year, Hellmuth has now final tabled an incredible 50 of the 107 events he has cashed in. He also extends his runner-up finishes record, recording his tenth, second place in Event #7. That is three more than his nearest competitor, same as in his bracelet tally. Thus, of 50 final table appearances Hellmuth has either won or come runner-up in 23 of them. Hellmuth also leads the category of most 4-9th place finishes, with 29. Selbst Soars: Vanessa Selbst won Event#2, the $25,000 Mixed-Max No-Limit Hold’em event, and in so doing, established several new records for females. She becomes the only female to amass three WSOP gold bracelet victories in open events. She also moves into a first-place tie with Barbara Enright with three bracelets overall. Selbst, by virtue of her two cashes in 2014, has won a record $876,665 in one WSOP, the most a female has ever taken home in Las Vegas, edging out Loni Harwood, who took home $874,698 last year. I-ing History: Phil Ivey added to his bracelet tally this year, winning his 10th. Ivey moves into a second-place tie with legends Doyle Brunson and Johnny Chan. Ivey’s the youngest player to reach the 10-bracelet mark in WSOP history. Most Bracelets by One Country in a WSOP: The United States has won an incredible 52 out of 64 bracelets this summer, the most the U.S. has won at one WSOP. Whoa Canada: After winning a record 10 WSOP gold bracelets in one WSOP last summer – the most for any country besides the United States – Canada has been shutout of bracelets this WSOP. That hasn’t happened since the 2002 WSOP, when the U.S. took down 32 of 35 bracelets up for grabs. Perhaps the Canucks are too busy celebrating back-to-back No. 1 picks in the NBA draft, or both male and female deep runs at Wimbledon, or their double Olympic Gold Medals in Hockey and Curling at the recent Winter Olympics. Maybe it’s the Toronto Blue Jays flirting with first place in the AL East. We’re not sure the reasoning, but if Justin Bieber has taught us anything, it is you can’t keep a Canadian down long. We expect a rebound at WSOP Asia-Pacific or next year’s WSOP for sure. The World Series of Poker (WSOP) is the largest, richest and most prestigious gaming event in the world awarding millions of dollars in prize money and the prestigious gold bracelet, globally recognized as the sport’s top prize. Featuring a comprehensive slate of tournaments in every major poker variation, the WSOP is poker’s longest running tournament in the world, dating back to 1970. In 2014, the event attracted 82,360 entrants from 107 different countries to the Rio in Las Vegas and awarded over $225 million in prize money. In addition, the WSOP has formed groundbreaking alliances in broadcasting, digital media and corporate sponsorships, while successfully expanding the brand internationally with the advent in 2007 of the World Series of Poker Europe. For more information on the World Series of Poker, please visit www.WSOP.com. ONE DROP—a non-profit organization created in 2007 by Cirque du Soleil Founder Guy Laliberté – strives to ensure that water is accessible to all, today and forever. ONE DROP significantly and sustainably improves living conditions through innovative projects which promote self-reliance in communities worldwide. To learn more, visit www.ONEDROP.org. I am looking for information on exhibiting at this year’s World Series of Poker at The Rio.